Firstly, I must apologize for not blogging in what seems like forever. A lot has happened since I boarded my plane from NY to Moscow. We got to the airport, checked our bags, and proceeded to our terminal. We hung out for about an hour and a half and then we boarded our plane for Moscow! I had a window seat which I was very thankful for because I love looking out the window on flights. We were all hoping to get some sleep on the plane but that did NOT happen. The sun never set while we were flying to Moscow so it never felt like night time. No one could sleep so we sat around and practiced our Russian and watched some movies. Finally, we arrived in Moscow at around 10 in the morning. This was a little bit of unfortunate timing considering we weren’t boarding our night train to Kirov until around 8:30 at night. Everyone was exhausted but nonetheless we took a tour around Moscow and powered through. 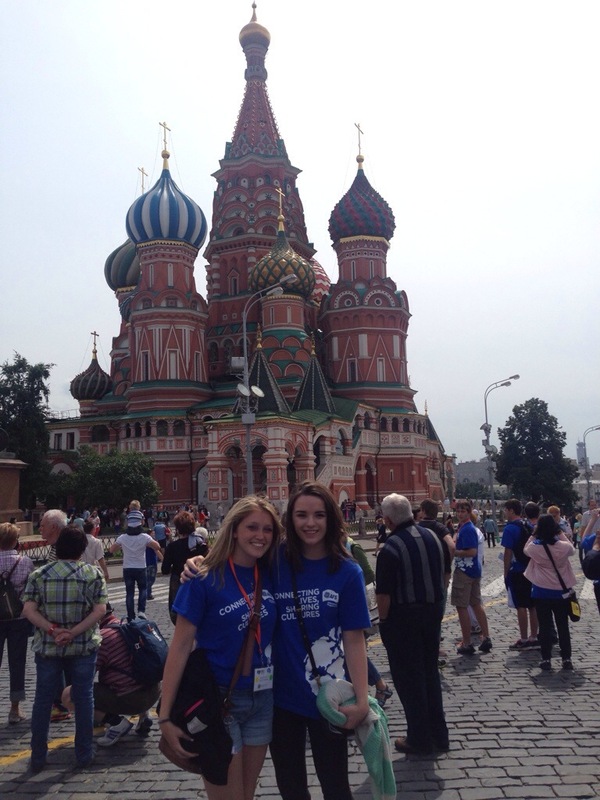 We went and saw the Red Square, went to some shopping malls, looked at some views, and saw some memorials. At the last memorial we went to almost everyone on the bus was asleep, so only five of us powered through and went and walked around. Around 7 pm it was time to go to the train station! We were all relieved to finally be on our way to Kirov, and especially to be able to sleep. So all 15 of us americans got off the train and grabbed our luggage and what happens? It starts to pour buckets and buckets of rain. It was raining so hard and we were frantic, running around trying to find shelter. By the time we found shelter I was completely soaked. Now everyone was not only tired, but we were also wet so we were even more thrilled to be getting on the train. We finally arrived at the train station completely soaked and ready to sleep. Our experience on the night train was very interesting. The train was very narrow and there were tables and bunk beds lining the aisle. Everyone socialized for a little bit and then eventually everyone passed out for at least a little. I slept very well because I was exhausted. I woke up around 7 in the morning and stayed awake for the last two hours of the train ride until we arrived in Kirov. When we arrived in Kirov our two teachers Larisa and Anna picked up up and we boarded a bus to take us to the hostel that we’d be staying at for the next three weeks. We dropped all our luggage off and then we walked to breakfast. From there everyone changed and we had orientation and some people went to the store to buy basic necessities. Everyone was exhausted so people went to sleep fairly early to be ready for the classes that started on Monday. Monday came around and everyone was excited and also nervous for classes. Monday morning came around and everyone was very excited for classes and ready to learn russian. We first have a class in the morning with all 15 Americans and we do lots of phonetic drills. We then split up into two groups and one group goes to Larisa for and hour and a half and the other group goes to Anna and then we switch. Larisa’s classes are more emphasized on the speaking and Anna’s class is all about grammar, spelling rules, and a little bit of speaking. Throughout the week we made if through four chapters I out books so we are moving very quickly. Russian is very difficult but I love the language! This week we visited the old part of Kirov, and the newer parts and went to some beautiful cathedrals and saw some amazing memorials and statues. I will post very soon again about the food and our daily schedule here! I’m going to lose wifi because we are going on an excursion to a small town outside Kirov! Sorry again for the lack of posts(mainly for you mom) but I will post more later today! Да свидания ! Previous Post Update from NY! Next Post A more detailed update!